Batatas a Murro, or Smashed Potatoes, is a traditional Portuguese potato dish that uses a unique style of preparation. Potatoes came from Chile to Europe during the ‘Age of Discoveries’. It quickly became a ‘crop of the people’ and fueled the growth of the European population. Since then it has been a traditional condiment in Portuguese cuisine, for its preparation, simplicity and great flavor. As a good Mediterranean old dish, ‘batatas a murro’ combines lots of olive oil and garlic to create soft and delicious ‘punched’ potatoes. This is great to complement a larger entrée, especially if it is a saucy dish. These potatoes are perfect for absorbing and highlighting rich sauce flavors. 2) Pierce the potatoes all over with a fork and then place them on a greased baking dish. 3) Once the oven is ready place the potatoes on the baking dish in the oven for about one hour. 4) Remove it from the oven and smash each potato with the backside of a large spoon in order to create large indents. 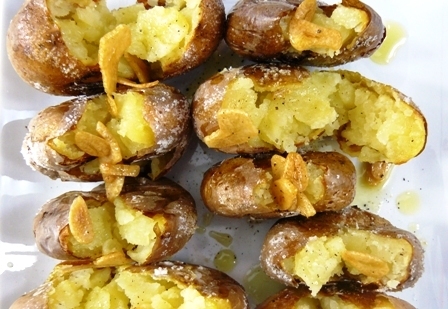 5) Now cover the smashed potatoes with the garlic, salt to taste, and olive oil. 6) Place it back in the oven for 15-20 minutes. 7) Remove from the oven and let it cool for 10 – 15 minutes. Serve while hot.